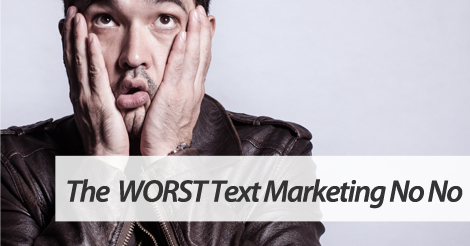 There are tons of cardinal text message marketing sins, so don’t think this one is the only no no. But, to keep it simple, this one mistake is probably the absolute worst. Not only is it completely against text message marketing best practices, but this bad habit could also get you in a slew of legal trouble. Bet you’re dying to know, right? Well, let’s cut to the chase. The worst thing you can do? Add a phone number to your list without expressed permission or written consent. Let’s say you’re a marketing consultant. You work with a tight knit group of 25 different clients. For communication purposes, you have each client’s personal cell phone number. Now, some may think “Sure, why not? I’ll add these numbers to my text message marketing list.” On the surface, this might not seem wrong. But, it totally is. To send out mass text message campaigns to your client list, you need their written or verbal consent. Without this, you’re stepping outside text message marketing law, and taking a huge risk. With that said, growing your text list is pretty simple, as long as you follow the rules. If you have contact information for all these clients, shoot out a simple email. Explain your text list, why it would be useful to them, and how to sign up. Then, when your list grows, you know you’re growing it the right way. You don’t have to worry about breaking the law, upsetting your customers or clients, and screwing up your chance at text marketing success. Partner up with the top text message marketing provider, SlickText.com. Give us a ring today at 1.800.688.6290, or head over to our pricing page and sign up for a free plan. We’ve worked hard to develop a feature rich platform that prioritizes small business growth.